This smartwatch is really SMART! Swimmo users will have a whole toolbox full of possible trainings and goals thanks to unique smart features that will help guide you and send friendly remainders during the swim. That’s right – IntensityCoach, PaceKeeper and TrainingGuide will all provide real-time feedback to swimmers during the swim. If you loose intensity or picked up the pace to rapidly you want to know it when it happens not after the whole training! 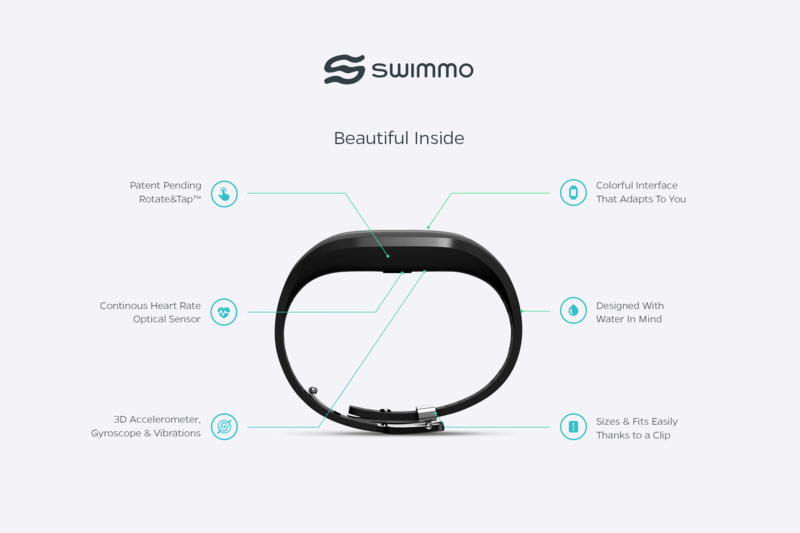 Swimmo is giving you just that. Next thing that was our great ambition was to free the swimmer from those horrible chest straps! So we’ve build (after many months of trials and errors) brand new sensor that will allow to read the pulse from swimmer’s wrist. 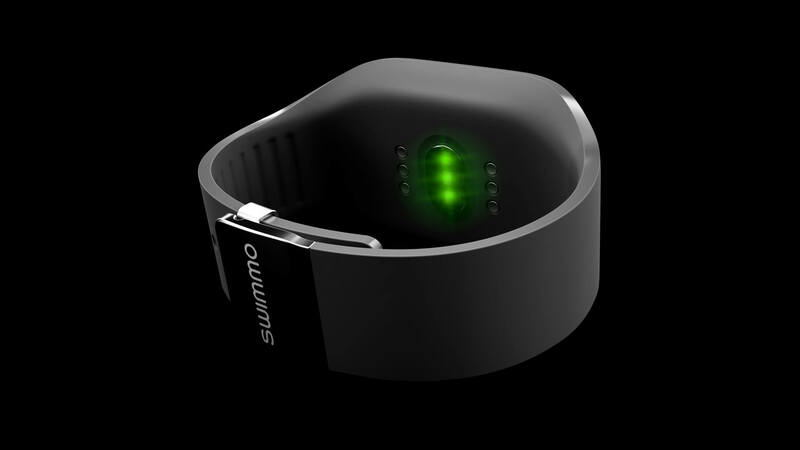 This is not only comfortable but also alows Swimmo to analyze the heart rate with conjunction with the rest of measurements and give you the most complete and rich real-time feedback from any smartwatch in this category. 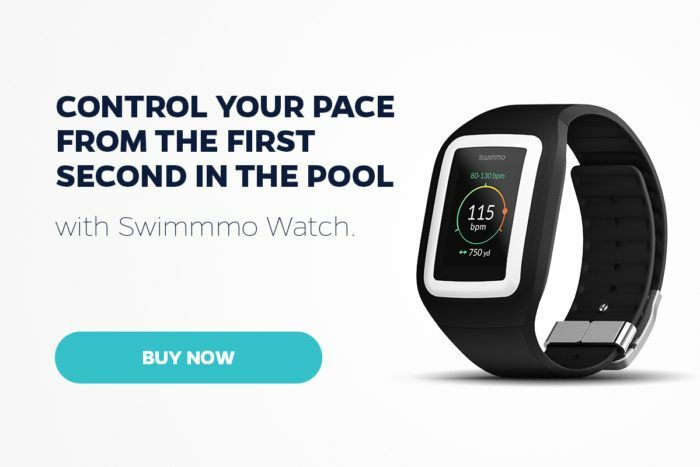 Another good example of how we designed Swimmo is the interface and how you control it. Smartwatches today, as they never focused on swimmers as we did, are big and cluncky but the worst thing is they have 5 or 6 buttons! How are you suppose to control this thing while in the pool? We didn’t know so we decided to create something new and different…That’s how Rotate&Tap was born and this is how we got rid of ALL the buttons. With simple flick of the wrist you choose an option from the menu and with a single tap you confirm your choice. That’s all and it is as easy to use as it sounds. Perfect app in a perfect world. We wanted to build an amazing mobile app for you to use with Swimmo. We knew that no one understands our product like we do and the app (for Android and iOS) is easy to use but full of features and all around exciting. You can read about it in our previous post). At the same time we understand that there are familiar and wonderful ecosystems and health sites that already are logging people’s progress in other disciplines. That’s why we’ve also integrated Swimmo with many popular systems like HealthKit, Endomondo, Swim.com, RunKeeper, Strava and many more! This way you – the user have a choice and can collect data from many activities in his favorite application. Yes, last huge difference between Swimmo and those models of Garmin is the price!. We’ve packed all that inteligence, technology, sensors in one georgous watch and still you are able to pre-order it on Kickstarter for almost half the price of the competitors. Swimmo right now is available for only 169 USD (even less in multipacks!) and mentioned models are 399-449 EUR. In other words there’s gonna be a lot more swimmers who will finally be able to afford great smartwatch.